First of all we’ll give a definition to SDIO peripherals and explain to our readers how it can be applied. Advanced users can skip this chapter, it’s an introduction. There are two main extension slot standards for handheld computers (to a lesser extent for smartphones): Compact Flash (CF) and Secure Digital (SD). There is only one exception with Sony handhelds that comply with the company's standard Memory Stick . Usually the SD slot comes either with a CF slot or alone. The CF slot, in its turn, appears always with the SD slot (except for Sony handhelds and Asus A620). You can use the slot to extend the memory of the handheld. Without a memory card it’s difficult to listen to the music or watch films, as there is not enough RAM and integrated flash memory for these purposes. At the moment the maximum size of the SD card makes up 1 GB, and the price for it has dropped to some $100. Almost in all cases the SD slot supports MMC cards. As for the CF card it has the same price, however the maximum memory size reaches 12 GB (but the actual prices do not agree with the current mass market). In average a dual slot PDA weighs and measures more than a single slot model (SD). 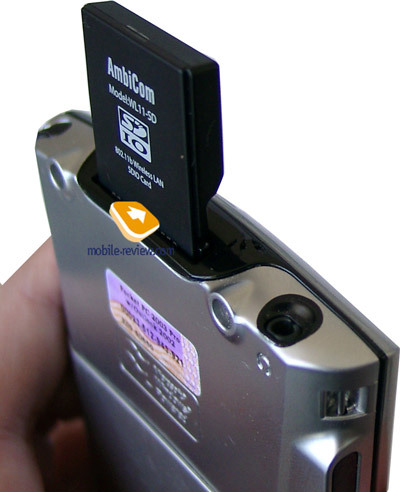 In addition to memory cards the slot can be used to extend PDA opportunities. Peripherals for the CF slot got very popular: cameras, Bluetooth and Wi-Fi adapters (from $40), GPS-receivers (from $100), GPRS-modems and so on. They are somewhat cheap and commercially available in Russia. When you use CF slot to plug peripherals, the SD slot stays for the memory. If the SD slot supports SDIO standard (Secure Digital Input/Output or SD I/O), it can be also used with the peripheral devices. You can learn more about the SDIO specifications from this document. The SDIO format involves almost all the peripheral cards used with the CF slot: Bluetooth, Wi-Fi, GPS, photo cameras, barcode scanners; only GPRS-modem hasn't been announced yet. The real SDIO equipment looks like this, the choice got quite rich. There are several key problems in the development of SDIO peripherals. Unlike the CF format, SDIO devices are still too expensive. For example, CF Wi-Fi module is priced about $35-40, while a cheapest SDIO Wi-Fi costs twice as much. 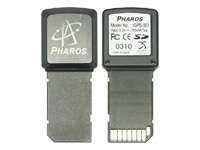 The same is true to GPS-modules. 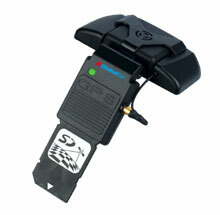 SDIO peripherals aren’t widely spread, you can hardly find such devices in shops, and the choice is quite poor. Finally, if you have a single slot (SD) PDA, so when you plug peripherals, there is no place left for the memory, and you have to limit yourself to RAM or the integrated memory. All these problems got gradually solved. 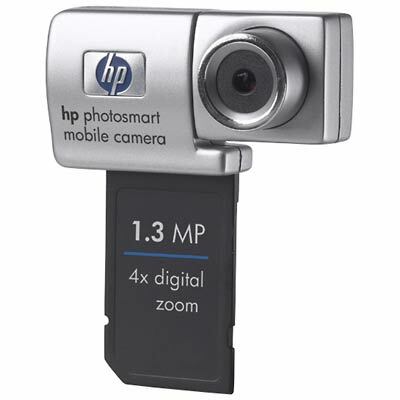 Prices do fall, the assortment gets richer, besides there appear devices that involve also flash-memory (for example, Bluetooth module plus 256 MB). 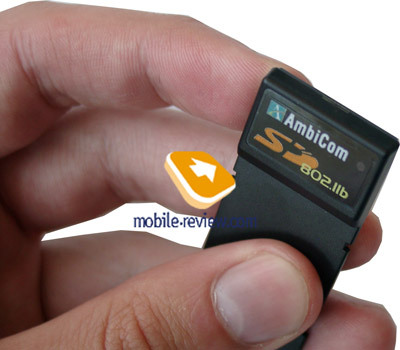 Today we tell you about a SDIO Wi-Fi card AmbiCom WL11-SD. 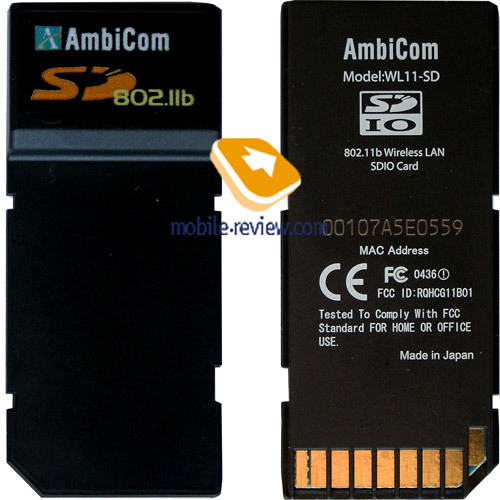 As a matter of fact, the SDIO WL11-SD card by AmbiCom represents a development of the Japanese company C-guys (the base model – SD-link11b was announced a year ago). We tested the card on the handheld computer HP iPaq 1940. Being plugged the card sticks up from the slot by a centimeter (the card size makes up 55x24x2.1 mm). You can try bending the card, it does give way, evidently it might get broken, should it fall. So we didn’t take a risk. There is another point in the assessment, during an intensive data transfer the card gets overheated. We didn’t have any problems while installing and tuning the Wi-Fi SDIO card. The system recognized the card at once after the driver’s installation had been completed. Another minute for the settings and entering a WEP-key, and the iPaq 1940 works with an access point. After you switch on the handheld, it gets automatically connected to the networks available, if you had set respective profiles. The whole procedure takes a couple of seconds after the Wi-Fi card was plugged. Bluetooth model can simultaneously work with Wi-Fi. The receiving sensitivity is good. In a 3-room flat with an access point the signal was received everywhere, and the signal intensity wasn’t less than 35% (that’s more than enough for a Web-surfing and file downloads). The data transfer speed was limited to 1 MB ADSL channel, it’s even much for a handheld (though the card specifications tell about 11 Mbps, the maximum speed for 802.11b standard). Wi-Fi manager turned easy in use and very functional. You can set and safe several profiles. There is only one shortcoming – from all safety standards the card supports only the vulnerable WEP (64 or 128 bit), no WPA support. With some exterior software you can transfer your PDA into an IP-phone. The most interesting point in our review deals with the power consumption. 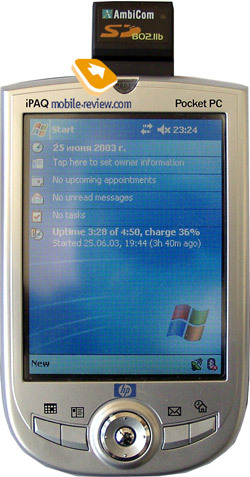 The handheld lasted for 2 hours on Wi-Fi with the second level of the backlight (for the iPaq 1940 the screen stays quite bright even at the minimum level) and under the continuous and average intensity Web-surfing. It’s a very good performance for an average iPaq 1940 battery. The second test revealed that the handheld was good for 5 (!) hours in the following conditions: the backlight was off, Wi-Fi connection was active, and the handheld lied on the table to be discharged. Thus, we may judge that the power consumption is optimized, and the battery life depends greatly on the data transfer intensity. The card is compatible with the following operating systems: Pocket PC 2002 and Windows Mobile 2003 for Pocket PC. In future AmbiCom promises to add the support of Palm OS 4 and 5, Linux and MS Windows XP. We hope the promises come true. Listed for $80-85 the card is good for those who have a PDA without Wi-Fi support and do need a Wi-Fi access from this PDA. There is no problem to install the card and tune the settings. It turns to work steadily. The power consumption is optimized – the handheld displays a good battery life. Minuses: the card supports only WEP safety standard, it sticks up from the slot, it’s impossible to use a memory card together with Wi-Fi 9however the fact isn’t that crucial, if compare with SDIO GPS when we should use heavy navigation cards). 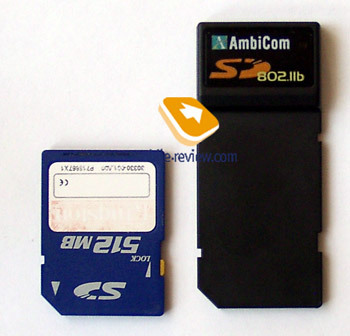 Note, you can also buy SDIO cards, which combine Wi-Fi adapter and flash-memory, however they are much more expensive.